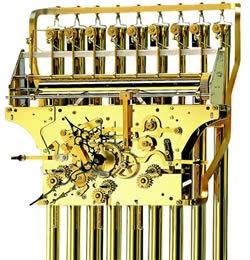 To ensure a very long life and consistent functioning, Kieninger recommend that their movements are lubricated every five years, and dismantled and cleaned every ten years. 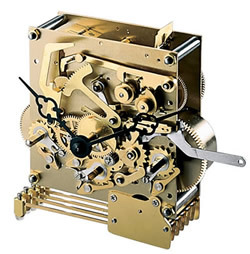 Even in the best environment the air is full of microscopic airborne particles, and it is these particles that find there way into the mechanism of clock movements; blending into the lubricating oil, causing it to thicken and increasing the friction of bearings etc. Adding fresh lubrication may be sufficient to flush out the old lubricating oil and absorbed debris, but there are pivots etc that are not accessible without dismantling the movement. 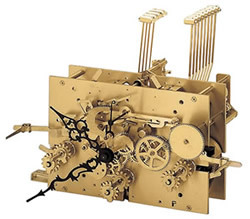 Eventually debris will build up on wheel and pinion teeth, which is why it is necessary to totally dismantle clock movements, so that all of the internal parts can be thoroughly cleaned. Following which the movement will be reassembled with fresh oil and grease applied to all bearings and sliding surfaces etc. 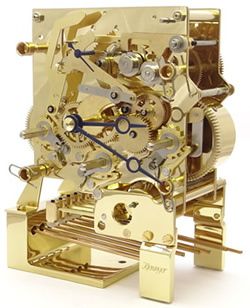 Please contact Frank at Oakside with details of either the clock model number, or the movement type and approximate age, and we will advise you of our prices for movement servicing and repair.